Way to go Bonnie! One day you won’t be the only one at the table with a reusable dish. I often see families on tv (yes, usually reality tv – I’m guilty) using paper plates, and it drives me nuts. I always figured, the more people you have over, the more people to help with dishes, so bring on the real dinnerware. You know what I’d like to see an article on is the term, “environmentally friendly”. I heard an ad for a bin company on AM730 yesterday saying that they handle your garbage in an “environmentally friendly” way. Sure, they more than likely recycle what they can, but I don’t see how building a warehouse, using bulldozers and back hoes, burying what’s not recyclable, etc. is “environmentally friendly”. Perhaps “responsible” is a more accurate term? We “responsibly” handle your waste? Environmentally Friendly smacks of green washing to me. “Responsibly” sounds like a more honest way of describing what is being done because quite literally NOTHING is environmentally friendly. Those recyclable containers for the leftovers? Made of plastic. Even the term “responsibly” can change over time. It used to be “responsible” to put everything in the trash can, meaning that you weren’t littering, but now many people would think of that as “irresponsible” becuase many more materials can be recycled. I agree that greenwashing is rampant these days, and recycling is definitely not the answer. Recycling plastic takeout containers isn’t even CLOSE to as good an option as avoiding them in the first place. 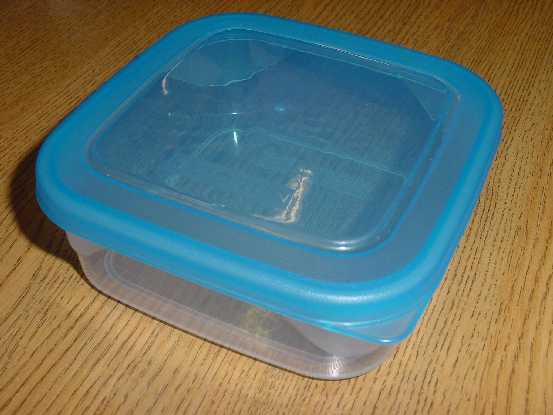 And even though we rely on our trusty reusable containers, I’m the first to admit that even reusable containers eventually crack and break, and will eventually end up downcycled or landfilled. Awesome. I’ve been doing the same and am happy to report that some friends are starting to follow suit. Us Y-Chromosome types don’t have the convenience of a purse to put plastic containers in. I find the best solution is zip-lock bags that get washed and reused. They fold well to fit in your pocket and are reasonably leak proof. You’re totally right Steve. My purse suggestion was a little gender biased. I should have also mentioned that when I am out and about, I carry a resealable container with the cutlery inside – no spills or mess. (And I actually usually have a side bag or a backpack rather than a purse). When I go to someone else’s house, I sneak a plate out of the cupboard even if they are using paper ones and discretely wash it when I’m done. Not only do I bring my own “to-go” container to restaurants, but I pack a cloth napkin, bamboo cutlery, klean kanteen, and glass straw! (I have a big purse.) That way, like a good little scout, I am always prepared. Now if it would only rub off on my friends. Glad to hear it has on yours. takeout without is an awesome and much needed campaign! Bringing your own food container is a good idea. As much as possible I avoid taking out to avoid waste. was delighted to see a restaurant (serving all local, real, unprocessed food) that had chinese takeout style containers from unbleached recycled cardboard. i actually made a little sigh of relief when i saw it. it’s better of course to have a reusable, but they were way way better than the standard styros. Once I and a friend ordered a take out pizza and my friend convinced them to allow us to take it in the deep dish. We were eating it nearby at an event we were holding, but I think my friend enjoyed walking it over and she got lots of comments (I had to man the event while she picked it up). I don’t usually order a full take out pizza, so haven’t done this again. They are used to me showing up with my own single slice container though. I love the idea of taking the whole dish! Must have taken some convincing though! I’ve also heard of people reusing their pizza boxes.